This newly-opened northern Vietnamese restaurant has a concise, focused menu featuring just a handful of noodle soups and an even smaller handful of appetizers. The cha gio came two to an order and was of the rice-paper variety. 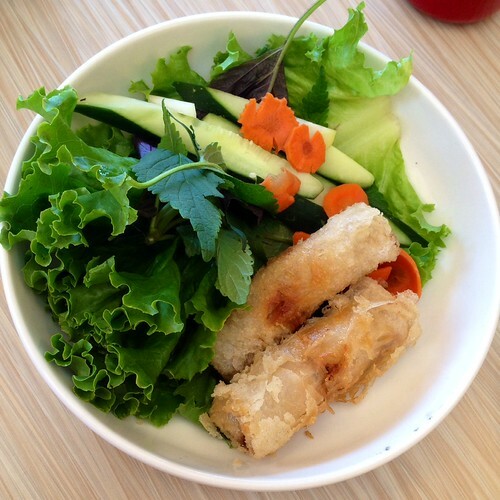 The rice-paper was fried to a shatteringly-crunchy texture and had a great tang to it. The filling is standard. The pickles that come with it, an afterthought. The dac biet contains tender and not-so-tender pieces of beef and ample offal. The tripe is cooked to perfection — neither too chewy nor too soft. The noodles are of the thicker rice noodle variety, which I’m a fan of. The broth, being from a northern-style place, is more subtle than the ubiquitous southern-style beef broth. Absent are the spicy notes of cinnamon and anise. Instead, the broth has a fattier mouth feel and is on the blander side. My meal also included a free lemon iced-tea thanks to their Grand Opening promotion. The tea was on the sweet side, even after the ice had mostly melted, but the lemon taste was refreshing after a mouthful of the rich broth. 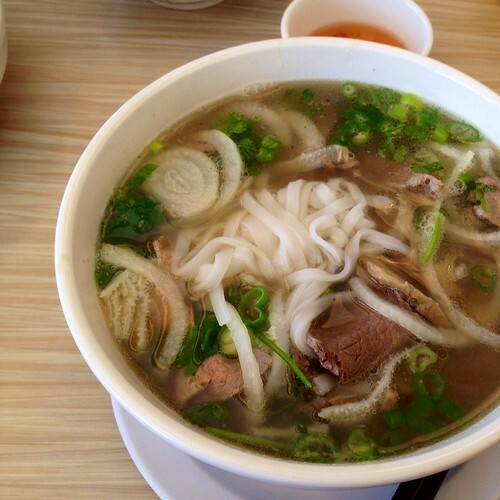 Is this going to replace Golden Deli or Nha Trang in my viet noodle-soup rotation? Probably, not.